Warning! Promotion - for those who buy a paper version of the book, the Kindle version of the book - for free as a present. Hurry up. This is a self-improvement, psychological book with the goal to improve your current financial situation. The bookâ€™s title â€˜Monetaliaâ€™ comes from the Latin term for money â€˜monetaâ€™. Monetalia is divided into two parts â€“ a psychological and a practical part. The authorâ€™s goal behind this is to give the reader two perspectives. 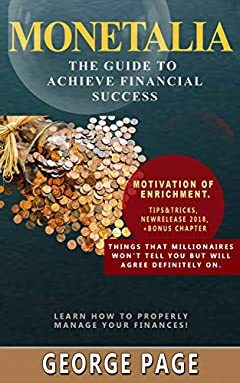 The first part, the psychological, discusses the details about the power of the mind on your current financial situation. However, the author believes that psychological advice without practical advice is completely useless. Thatâ€™s why the second part talks about useful practices you can incorporate into your everyday life. Things That Millionaires Wonâ€™t Tell You but Will Agree Definitely On. Â So, do not delay! You have the opportunity to buy this book at a bargain price right now and in the near future to change your financial position for the better.